IBM Tivoli Configuration Manager controls software distribution and asset management inventory in a multiplatform environment. It is designed for configuration, distribution, change, version, and asset management in a distributed computing environment. Working on top of IBM Tivoli Management Framework, IBM Tivoli Configuration Manager provides an integrated solution for managing complex, distributed enterprise environments. 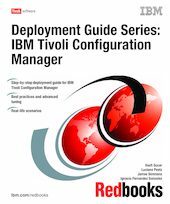 This IBM Redbooks publication introduces the IBM Tivoli Configuration Manager logical and physical components and covers detailed planning and implementation steps to deploy IBM Tivoli Configuration Manager in small-to-medium and large-sized environments, including IBM AIX 5L, Microsoft Windows, Linux, and IBM OS/400 systems. In addition, we talk about best practices, advanced customization, and tuning topics for IBM Tivoli Configuration Manager. This book will be useful for IT specialists responsible for implementing IBM Tivoli Configuration Manager V4.2.x in customer environments.